While our blog and series of webinars have so far mostly focused on the key findings of our Workforce 2020 research by region, our data also reveals some strong stories around the difference in strategies—and progress—by industry. For example, companies from different industries report varying levels of confidence in their progress toward meeting workforce goals. 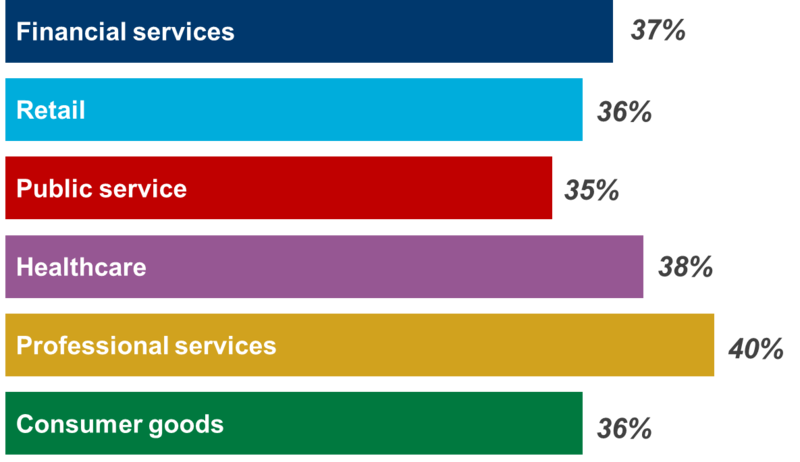 Professional services companies are most likely to say they are making good or significant progress (38%), followed closely by healthcare (37%). The industry least likely to say so? Retail—only 31% of respondents say their company is making good or significant progress toward workforce goals. In many ways, strategies are similar across industries—problems with workforce strategies do not exclude anyone. For example, companies across industries are roughly equally likely to say they widely offer competitive compensation. Approaches to succession are also similar—very few say they plan for continuity in key roles. For more industry-specific data and analysis, check out our series of fact sheets. We’ll also keep you posted on the webinars scheduled for the next few months, which will include insights on the industries we surveyed. This entry was posted in Research and Reports and tagged Industry variations by Adrianna Gregory. Bookmark the permalink.